Our reindeer roaming here in the highlands of Scotland live in a truly unique landscape, that has been sculpted over the centuries. 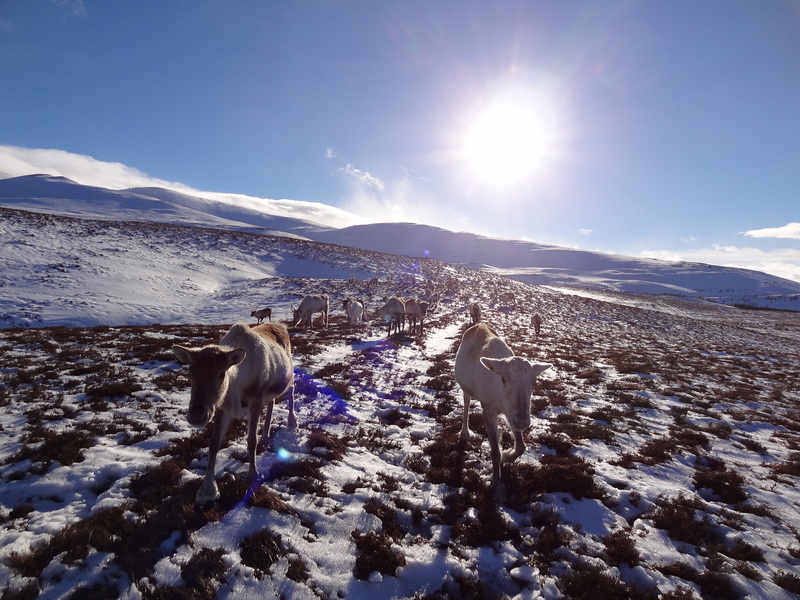 However, the formation of the Cairngorms is not known by many, and so here I’ve summarised a brief part of it to explain how the reindeer got their home. A herd of females, happy in their home grounds, the Cairngorms. 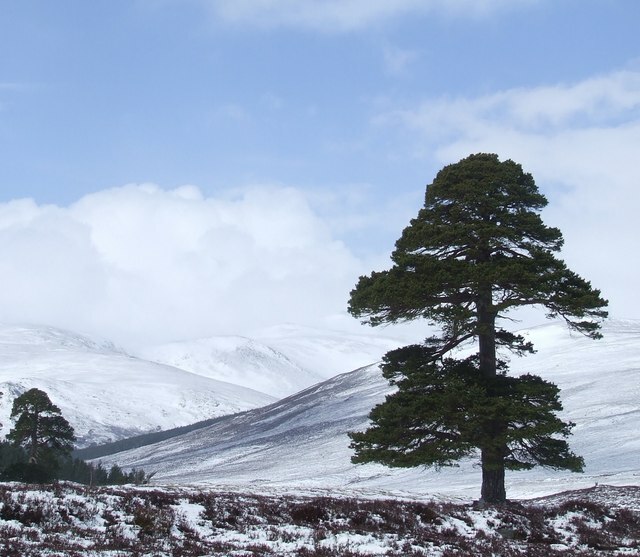 The Cairngorms are underlain by 427 million year old Granite and were, believe it or not, once in the range of the Himalayas standing far higher than today. Millions of years of degradation and the prolific effects of repeated glacial (cold) and interglacial (warm) cycles throughout the last 2.5 million years (Quaternary) have carved out the landscape in which we see today. About 13,000 years ago, cold glacial conditions were increasing in many parts of the Northern Hemisphere. 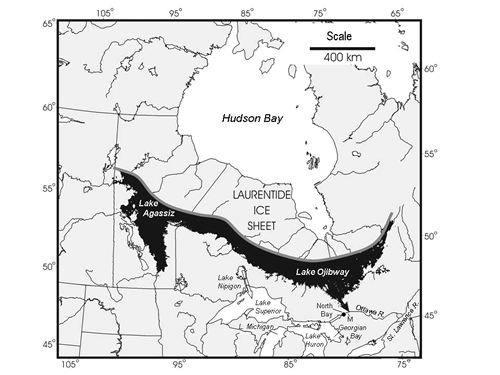 There have been many debates as to why this happened but scientists have hypothesized that this major cooling event was caused by an enormous dumping of fresh water into the North Atlantic by the large North America Lake Agassiz. As the ice retreated from the last glacial maximum 21,000 years ago the lake burst its banks causing a catastrophic flood. 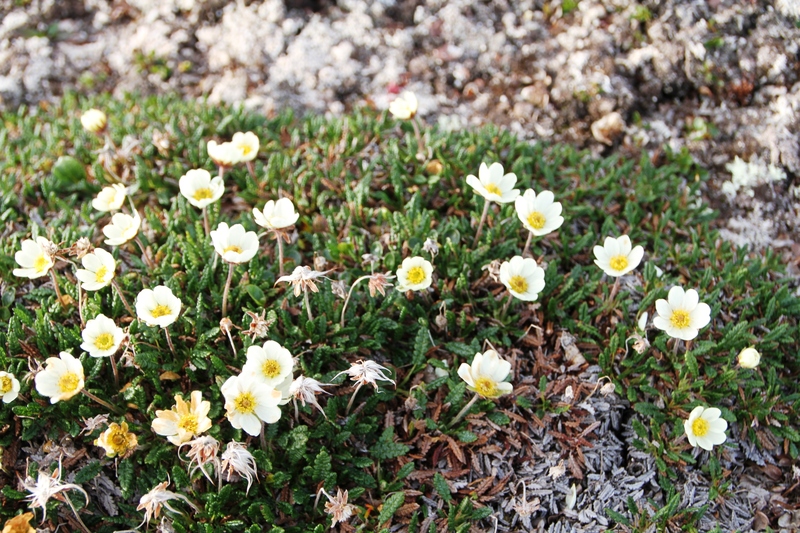 The flower (Dryas octopetala), the Younger Dryas or, Loch Lomond Stadial, marked the return to what we see today. The beautiful wee flower, Dryas octopetula. Photo from Wikipedia commons. This cold water slowed down the oceans conveyor belt or ‘thermohaline circulation’ to an almost standstill, meaning there was a complete loss of heat transfer and a massive reduction in sea surface temperatures in the North Atlantic. The sea and the atmosphere share a sort of ‘love – hate’ relationship whereby if one is behaving well the other will behave; however if one decides to throw a spanner in the works its counterpart will throw quite the tantrum and this is exactly what happened. The rapid cooling of the previously warm salty sea water coming up the west coast of Scotland caused the atmosphere to cool dramatically; hence resulting in ice growth and incredibly cold conditions across much of Scotland. 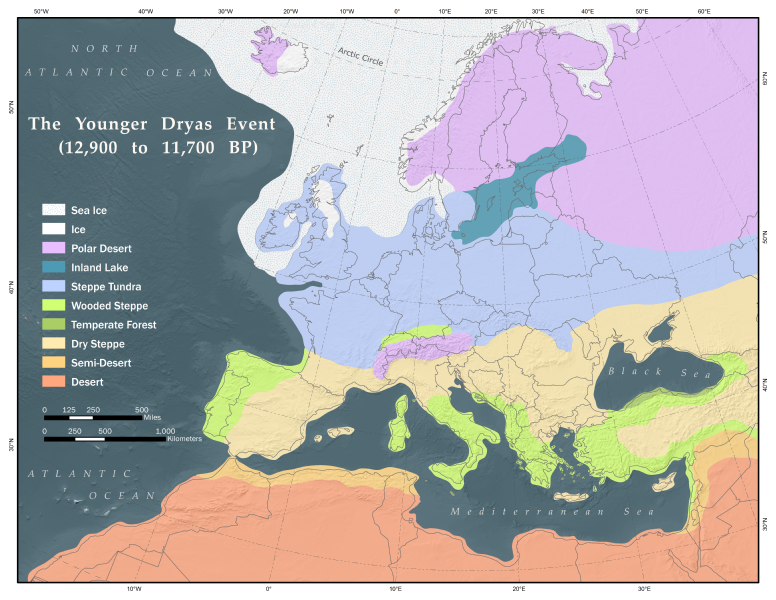 The land cover about 12,000 years ago in Europe. Notice the prevalance of ice and tundra habitat in the highlands of Scotland, where our reindeer now live. Photo from Wikipedia commons. This last ‘hurrah’ of ice has sculpted much of the landscape we see today. As the ice retreated, Scots pine rose up the mountains pushing the level of steppe tundra with it. The subarctic conditions that now occupy this landscape mirror that of Arctic Canada and Siberia meaning that reindeer can survive and thrive here in the Scottish Highlands. These wonderful animals now inhabit a land forged by ice so can therefore thank these bouts of extreme cold as without them we would not have our reindeer here today. A lone Scots Pine in Scotland’s snowy landscape. Photo from Geograph, licensed for reuse. Sadly because their reindeer are being kept in unsuitable conditions. There are plenty of other places with reindeer in the UK, but the Cairngorms is the only natural habitat left for them, due to it’s climate, altitude and vegetation.